No big words. No wasting of time. Here’s offering you the quick guide to the best restaurants and cafes in Mcleodganj & Dharamsala. I know that foodies is a breed with little patience. So before you can count to ten, I’ll take you to the best food of Mcleodganj. Here are all the answers to the many food and restaurant related queries about Mcleodganj that I have been frequently asked. One of my favourite restaurants in Mcleodganj, Moonpeak Thali and Cafe Moonpeak are my all-time favourites. Running in its 18th year now, Moonpeak is more of an artsy establishment with an owner who is besotted by butterflies and flora of the region (more on this later). While they pack a lot of punch in almost everything that they offer, Himachali Thali is precisely why you should go here. A riot of flavours from the hill state, the thali is massive in quantity and is a must-eat; it has gajar-matar sanji, kadhi, mattar sabji, gatte ki sabji, rice, chapatis, pickle and steamed rice. The tiny dessert bowl is a delight and I appeal for a bigger one! This giant meal is best followed by one of their teas, I loved hibiscus. Quaint interiors, fast service, friendly people, amazing food and a gorgeous sunset point too, Tibetan Mandala is a must visit. My pick at Mandala is scrambled tofu, whole grain bread, best taken with a lemon honey tea or mojito in my case. Free wi-fi; smoking not allowed; also has outdoor seating area. Coffee and tofu for one comes for INR 200 plus. Moonpeak, one of the best restaurants in Mcleodganj, is more of an experience rather than just a cafe. Walk in for great coffee, fruit shakes, Himalayan thali and more amidst an ambiance that is straight from old Bollywood. Movie posters, memorabilia, actors’ dialogues written across the walls, all more alive with the backdrop of classics of Bollywood music. Must visit for Bollywood buffs and the lovers of Rafi, Gurudutt, Madhubala and the likes. Free wi-fi; smoking not allowed; also has outdoor seating area. Coffee and more starts at INR 100. Tsewang has her kitchen right outside Tibet Kitchen. Your best bet for fried momos at Mcleodganj. A lovely lady, Tsewang is so skilled at doling out these potato-filled, fried momos that she is, usually, out of stock by afternoon. So make a beeline for these. A plate (six momos) comes for INR 20. Though Mcllo looks like a typical restaurant that can serve nothing other than North Indian fare, it’s a delight to dig into the mashed potatoes here. Dollops of cheese and thinly sprinkled black pepper can make one fall in love with the dish. Also has seating arrangements at the terrace, where smoking is allowed. A bowl of mashed potatoes comes for around INR 120 plus. Oooh… what do I write about Chocolate Log. Brainchild of Ms Cheryl, who is also the only chef here, Chocolate Log is a far-from-public-glare cafe on Jogibara Road. Savour the apple pie, lemon cheesecake, pasties and more. It’s good food made with great care. Smoking not allowed. The best place to get handmade desserts. A piece of apple pie comes for INR 80. 6) Yak Cheese Pastries, Beetroot Nut Slices, Muffins and breads at the Tibet Quality Bakery! Remember the sweet shop at Hogsmeade, the village outside Hogwarts in Harry Potter? This bakery is straight out of it, as it amazes you with the huge variety. A one stop shop for refreshments, it has so much of baked goods on offer that choosing one or even some becomes a task. Run by a friendly chap, who also runs a homestay right by the bakery. The goodies here start from INR 10 a piece (for chocolate balls). The only thing that you need to keep in mind while ordering food at Tibet Kitchen is to stay away from anything that says chillies, for it’s used in large proportions here. Rest is good and authentically Tibetan. Smoking not allowed. Great place for Tibetan food in Mcleodganj; impressive ambience; huge menu. Dishes on the menu start from INR 200. If you’re an I-can-survive-on-simple-light-food person like me, this is your place for dinner. A good quantity of steamed rich with tofu is a huge thumbs up even on the health count. Coffee is good too. Coffee Talk also has a nicely stocked book shelf for a good time. Food items here start from INR 80. 9) Pizzas, Pastas, Waffles (a must must) and all that Italian at Jimmy’s for dinner. One of the most impressive book collections of all the cafes at Mcleodganj, Jimmy’s got great Italian food too. I wrote that because there is no doubt about the yummy quotient of the food at Jimmy’s. The waffles here are worth ordering again. And again. Perhaps these waffles are one reason that make Jimmy’s one of the best restaurants in Mcleodganj. Food at Jimmy’s starts from around INR 100. 10) Ice cream shakes, Tasmpa Porridge, Kangra tea, and huge burgers at the Black Tent Cafe. A recent addition to the Mcleodganj food circuit, Black Tent Cafe scores high with good food, generous portions, friendly service and (of course) a book collection that’s open to the visitors. Also, a good place for the lovers of Kangra Tea. Wednesdays during tourist seasons also see musical evenings at Black Tent! Food at Black Tent starts from around INR 100. Look out for this one on your way to Bhagsu waterfalls from Mcleodganj. A shack-like eatery, German Bakery is one great place to dig into all food Israeli. Loved their falafel and humus. Still craving you see. Other than these eateries, there is a lot of interesting stuff happening in the food scene at Mcleodganj. Some of the must visits are Kunga’s (chocolate mousse! ), Illiterati (for its impressive food, great books and a grand piano), Lung Ta (the really authentic Japanese restaurant), Nick’s Italian (quiches are gorgeous) and the Peace Cafe (for great Tibetan breads). 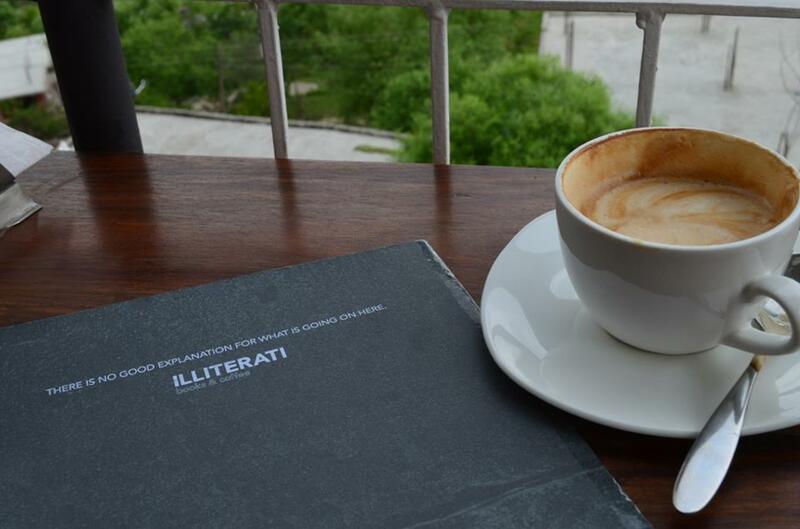 Illiterati Cafe is perhaps my favourite, largely owing to the vibe it has. A grand piano sits in almost middle of this place, guitar sessions are an every evening thing, day’s specials, endless cup of coffee, and some very rare books can be found here. If nothing, walk in here alone and you will come back with new friends in tow. A very happy, positive energy and endless views of the Dhualadhars from its balcony are a treat. DO NOT MISS IT. 13. All things Italian & juices at Morgan’s Place, Dharamkot I discovered Morgan’s Place a few months back while roaming around Dharamkot. It was January and no other food place was open; placards written out of quirk and whims led me to this cottage-like eatery and I am glad that I stepped in. A wonderful menu both in terms of dishes as well as a dash of humour that it displayed had me wooed. Among the other things, must-haves are all their pizzas and vegetable juices (you’ll pretty much need it after your walk to Dharamkot). The best part at Morgan’s, if you are into pizzas like me, is that you can watch them dole one out right from scratch! So yes, the next time I get my hands on a huge oven, I can pretty well get you a piping, hot pizza. All thanks to the good folks at Morgan’s Place. Write to me if you think I’ve missed an awesome restaurant or cafe at Mcleodganj, and I would be too happy to add to this list. You can read more about the things to do at Mcleodganj here. This is very much satisfied by the great info in this blog.